This massive DVD collection follows the members of the Shropshire Caving and Mining Club (SCMC) as they explore the incomparable mining remains still to be found in Cornwall, both above and below ground. 22 separate fully-edited documentary programmes with commentaries, presented in a special 3-DVD library case. Mainly recorded in 1993, it also features footage shot in 1983 and 1987 of sites that have since changed considerably, and material shot during the 'InterNAMHO 2000' mining history conference. 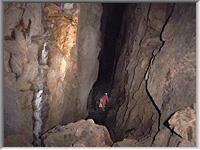 Join us in 1993 as we descend in the cage to the 380 fathom level, 730 metres (2,400 feet) below adit. Europe's last working tin mine, South Crofty was one of the oldest mines in Cornwall - copper was mined here in 1670, and probably 100 years before that. As we tour the 400 fathom level with the prolific mining historian and Crofty man Allen Buckley, a Clayton battery loco passes us hauling ore to the underground crusher, while Atlas Copco rocker shovels muck-out headings and ore passes. To save the slog of walking the 150 metres up the 1 in 4 decline from the 400 fathom level to the 380, we make use of the man-rider conveyor. Returning to surface we visit the 1.1 megawatt electric winder built by Fullerton Hodgart & Barclay originally for New Monkton Colliery in Yorkshire. A more detailed tour of the surface buildings is on disc 3 in the "Red River" section. Famous for its hundred-metre high cliffs honeycombed with old men's workings for tin, in the 1930s and 40s Cligga was worked for tungsten. With members of the SCMC we explore the mine in '93 and '94 using the Mk.1 'Borg' camera. 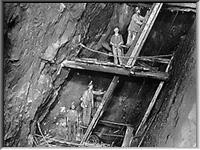 Sights include Cousin Jack ore passes, many small cavities where only the highest grade ore was taken, false floors, collapsed timbering and a vast stope. In the lower levels we see iron gates, old piping, cables & ropes, Contact shaft and the Beach Adit exit. We tour the workings of the only underground restoration project of its kind in Cornwall, during an InterNAMHO conference visit in 2000. The Rosevale Historical Mining Society are working on a voluntary basis to restore the mine to working condition, replacing timbering, re-opening levels and clearing drainage channels. The mine's busiest period was in the early nineteenth century and later it was worked by local miners who had returned from abroad. Great Condurrow Mine - the CSM training mine since the 1920s, plus a quick look at historic mining exhibits collected at King Edward mine. The former Holman Brothers Test Mine - originally developed to showcase and test Holman equipment such as drilling machines. This also became a CSM mine for practical instruction in surveying, mining and explosive techniques. Driven in the face of an old Carnmenellis granite quarry, the tunnels are riddled with drill holes! 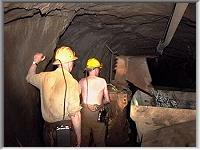 Many of the underground tours were recorded with revolutionary "Borg" video equipment developed by I.A.Recordings, which gives the viewer the feeling that they are exploring the mine themselves. This was well before the advent of helmet mounted Action cameras" which seem to be attached to everything today! The I.A.Recordings 'MapNotes' for Ordnance Survey 1:50,000 map number 203, has many sites featured in 'Mongst Mines & Mine Explorers. 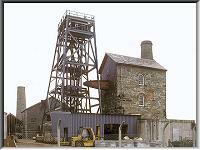 Michell's shaft winder, 'East Pool Whim' has been an ambassador for Cornish mining heritage for years. The nodding beam and slowly turning flywheel attract passing visitors and help the National Trust introduce them to the fascinating industrial history of the county. We see the whim in motion in 1983 and 1993. On the other side of Agar road, Taylor's shaft has the largest and most recently built beam pumping engine left in Cornwall, also in the care of the National Trust. 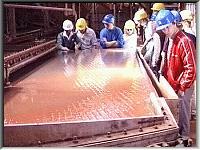 We see the massive 90 inch diameter steam cylinder and 53 tonne beam. Outside we explore the boiler houses, compressor house & horizontal steam winder house as they had been left, before they were renovated to house the Cornwall Industrial Discovery Centre. 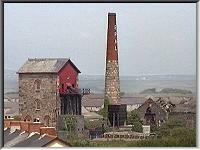 The Tolgus Tin Company operated a tin streaming works until 1985, recovering tin from waste left by other mines. We visited it in 1987 and saw the disused 12-head Cornish stamps, slime settling pits, Cornish round frame, Holman and James shaking tables and scoop wheels; plus modern plant such as flotation cells, a Bartles cross-belt separator and a Mozley concentrator - just as they had been left. In 1993 we went back to see how things had changed since the site had been taken over by the 'Cornwall Gold Centre' and the stream works managed by the Trevithick Trust. Afterwards we examined the Brunton calciner - described as the best example still surviving. Geevor tin mine was still working when we visited in 1987 for a tour of the dressing mill. We have a look at the buildings around Victory shaft, then examine the processing plant: vibrating screens, ball mills, shaking tables, froth flotation cells separating tin oxide from copper, arsenic and iron sulphides, a magnetic separator, a rotary drying kiln and the bagging plant. We then have a quick look at the mining company's own small museum. During the InterNAMHO 2000 conference, we were privileged to be given a tour of Wheal Jane tin mine site, including the 'mothballed' processing mill - the last to work in Cornwall. Double-deck shaking tables, banks of flotation cells, a rod mill and 3 ball mills, a Mozley Multi-Gravity Separator, hydrocyclones, screw densifiers and deep cone thickeners - just some of the plant we see in the mill, which pioneered froth flotation for commercial tin separation. Half way through the tour we get a chance to see tin smelting - the last tin ore from South Crofty is still being used to make Pure Tin Jewellery for the South Crofty Collection. 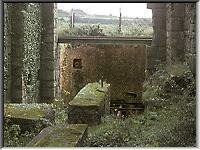 We also look down the still open Beecher's shaft and the huge modern 'No.2' shaft. 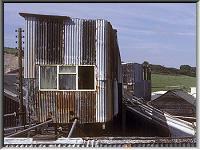 This chapter includes some views of the site while it was still working in 1987. Various views of China clay works around St. Austell seen at work in 1983 and 1993. The Levant mine site in 1983 and the whim in steam in 1993 and views of the nearby Botallack mine site and the famous Crowns engine houses. InterNAMHO 2000 River trip: On the Saturday evening of the conference, delegates enjoyed a chartered voyage from Malpas near Truro to Falmouth; passing King Harry ferry, Restronguet creek, Mylor creek and the Falmouth dockyard. A great deal of fascinating maritime industrial history was seen. Miscellaneous small mines: Brief looks at Cot valley including Wheal Hermon; Wheal Peevor, Porthtowan cliffs, Wheal Busy and Cape Cornwall. Starting with South Crofty in 1983 when the unique concrete pumping engine house was still standing, we move to 1987 and a specially arranged tour round Robinson's shaft area and views of the 'mothballed' Copperhouse Foundry 80 inch pumping engine. After looking at Cook's Kitchen shaft and the mill buildings from various vantage points, we see other sights in the valley such as the Tuckingmill decline entrance a year after work started. At 'Brea Addit' we see abandoned 19th century buddles near a modern streaming plant, then move to South Tincroft with its famous man engine house. 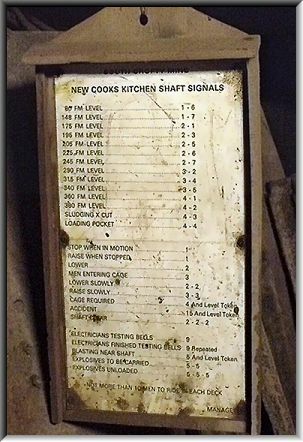 Jumping to 2000 we are lucky to be given a detailed surface tour of South Crofty Cook's Kitchen and Robinson's shaft buildings by historian and former miner Allen Buckley. Another fascinating trip during the InterNAMHO 2000 conference was the tour of Kennal Vale gunpowder works led by King Edward Mine's Kevin Baker. 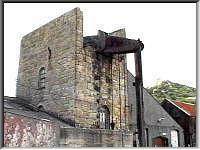 We start at the Perran foundry which was owned by the Fox family who started the works to provide mines with black powder for blasting. Pausing in Ponsanooth to examine a gunpowder proving mortar, we walk through Kennal Wood to see buildings used by the gunpowder factory and a later granite quarry. The powder buildings include 7 pairs of massive incorporating mills, where the constituents were mixed and ground by limestone edge runners. 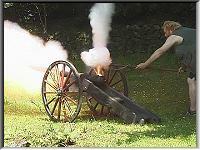 To round-off the tour and the whole InterNAMHO conference, historic firearms expert Colin Herriett demonstrates the power of powder! The Basset mines around Carnkie working the Great Flat Lode show one of the best historic mining landscapes in the world. We have a look round Wheal Basset stamps, West Basset stamps and Marriott's shaft in 1993, before the buildings were restored and the sites tidied-up and made safe for the modern visitor. Stamps double beam-engine houses, buildings for vanners, buddles and calciners date from the early 20th century but mainly used 19th century ideas. A more modern approach was evident at Marriott's shaft with its large horizontal compressor and very unusual under-beam pumping engine. The title of this DVD set is based on that of J.C.Burrow's seminal 1893 book "'Mongst Mines and Miners", which set the standard for underground photography for many years and helped inspire later photographers and film makers. 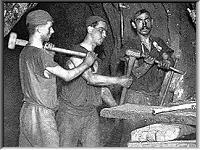 John Charles Burrow was awarded a medal for this collection and went on to perfect his techniques; but these early successes include some of the most famous photographs in mining history, such as "The Man Engine at Dolcoath Mine". We were fortunate to get permission to use very high quality prints recently taken from the original negatives; so we explore these in depth, moving around each image and often going in close to show details which haven't been easily seen before in book prints. We also show short explorations in '93 of the picturesque Wheal Coates mine site and the extensive and windswept Tywarnhayle copper mine. In 2000 we go on a walk around St. Agnes mines such as Wheal Kitty, Polberro, Wheal Luna and Wheal Friendly; with the well-known mining archaeology author and Cornish enginehouse expert Kenneth Brown. 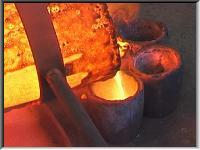 An audio-visual stills sequence showing additional mines and sites, including Blue Hills Tin Streams and Wheal Uny. Aerial views during the flight around mining areas of Cornwall during the InterNAMHO 2000 conference. 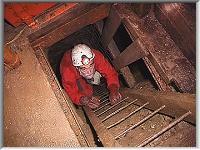 The Compilation "'Mongst More Mines" features further visits to mines in Cornwall and Devon in 2007. You can also read some independent reviews from leading UK magazines.